Don’t go round tonight; it’s bound to take your life. I hear hurricanes a-blowing; I know the end is coming soon. Or perhaps it’s just Nicol Bolas arriving in Ravnica for Hour of Devastation part two! Bad Moon originally comes from a period of design where black and white had a lot more mirrored designs than they have recently. It’s curious that black’s version of Crusade has fewer colored mana in its cost than white’s does, especially when it has other cards like Nightmare that want only swamps or only black cards. 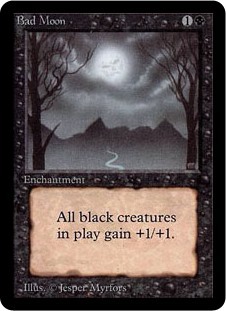 Regardless, Bad Moon is a solid card, although it doesn’t always fit as well in fast black decks as you might expect. Where white’s small creature decks often tried (and do try) to overrun an opponent quickly, which is exactly what a Crusade effect helps you do, the equivalent black decks take advantage of their disruptive abilities like Duress, Hymn to Tourach, Hypnotic Specter, and Blightning. When the opponent has no cards in their hand, they can’t do anything about your creatures regardless of their power and toughness. Bad Moon is simple, and elegant: two mana, buff everything that’s black. Including your opponent’s creatures, but who cares? Despite its efficiency, the symmetry of the effect means Bad Moon has yet to really pan out in today’s constructed formats (it is Modern-legal, having been reprinted in Time Spiral). It also has an issue of being a bit awkward to play with; black tends to go more for singular big creatures, and the “go wide” strategies black sometimes goes with (usually involving rrrrrrrats) tend to run tight decklists that don’t have room for cards like this. That said, Bad Moon is cheap and efficient, and I could see places for it to do work! Infect is a strategy where this might be intriguing, as buffing Plague Stinger and Phyrexian Crusader could be fun. I feel like there’s always a chance for the Bad Moon to pan out, but it just has not for whatever reason.